Spark Racing Technology today announced they'd created a consortium of companies that together will produce the electric race cars for the Formula E racing series. 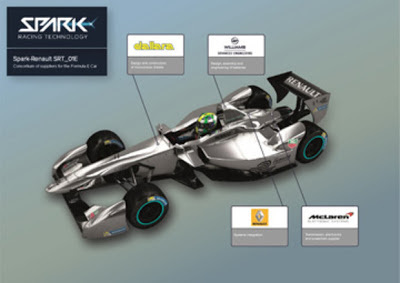 A decision by the FIA World Council on June 28, 2013 formally approved SPARK's application for homologation as the supplier of all the electrical single-seaters to the first season of Formula E Championship. SPARK will provide 42 cars Spark-Renault powered solely by electricity to compete in the heart of major cities all over the world. Williams: Design, manufacture and assembly of batteries and their battery management systems. McLaren Electronic Systems: Development, manufacture and supply of electric motor, gearbox and power & control electronics. Patrice RATTI (CEO Renault Sport Technologies): “As a global leader for the production of electric vehicles and with a unique expertise in motorsports ever since the company was founded, the choice of Renault as technical partner to develop the fully electric SRT_01E car for the FIA Formula E championship was obvious. Renault engineers and motorsport experts are directly contributing to the overall powertrain architecture and are in charge of electric systems' specifications and integration, benefiting from the experience acquired while developing the new 2014 Renault-Energy-F1 Power Unit.